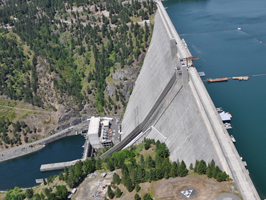 AHSAHKA -- Flows exiting Dworshak Dam are set to increase starting at noon Wednesday, to coincide with the release of juvenile spring chinook and steelhead from hatcheries downstream of the dam. According to a news release from the Army Corps of Engineers, outflow from the dam near Orofino will increase from about 1,600 cubic feet per second to 5,400 cfs. The increased flows are scheduled to last through Friday and will raise the water level on the Clearwater River near Peck by about 1 foot. Managers at the Dworshak National Fish Hatchery and Clearwater Hatchery, both on the North Fork of the Clearwater River below the dam, plan to release juvenile chinook and steelhead. The increased flows are designed to help the young fish avoid predators as they begin their migration to the Pacific Ocean.